Sinn Féin National Chairperson, Declan Kearney will be the guest speaker at this weekend’s annual Counties Derry and Antrim Republican Commemoration in Gulladuff. 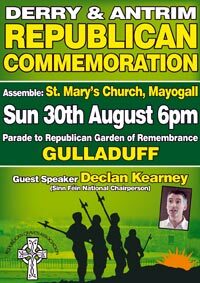 Speaking in advance of the major republican mobilisation, Magherafelt Sinn Féin Councillor Peter Bateson called on all republicans to support the event which will take place in Gulladuff on Sunday 30 August at 6pm. “I encourage all republicans to come out on Sunday 30 August to commemorate and celebrate the lives of all of those from the Counties of Derry and Antrim who gave their lives in the struggle for Irish freedom, equality and social justice. “This is a very important date in our local republican calendar and it gives republicans the opportunity to rededicate themselves to the ideals and aspirations for which our patriot dead paid the supreme sacrifice. The commemorative parade will assemble at the carpark opposite St. Mary’s Church, Mayogall at 6pm sharp before making its way to the ceremony at the Garden of Remembrance at Gulladuff. The parade will be led by South Derry Martyrs Flute Band.